Ronald Hamborg, age 83, of Olivia and formerly of the Belgrade area, died Saturday, January 20, 2018 at the Olivia Nursing Home and Rehabilitation Center in Olivia. Funeral service will be Saturday, January 27th at 11:00 a.m. at Cross of Calvary Lutheran Church in Olivia with Rev. Matt Hausken officiating. Burial is in the Olivia Cemetery. Visitation is Saturday at the church for one hour prior to the funeral. Arrangements are with Dirks-Blem Funeral Service of Olivia. Ronald Kenneth Hamborg was born December 13, 1934 in Colfax Township, near Sunburg, MN, to Casper and Ruth (Hanson) Hamborg. He grew up on the family farm in Colfax Township and attended country school. Ron served his country in the U.S. Army and was a member of the American Legion Post 0537 in New London. Ron farmed with his brothers in the Sunburg area and then worked doing heavy road construction with the Operating Engineers Local 49. He retired in 1991 but during this retirement period he built custom trailers for several years. Ron married Betty Tabery on November 2, 2002. Ron and Betty made their home at Belgrade and in 2015 moved to Olivia. 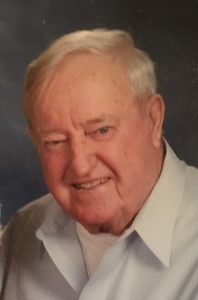 Ron had enjoyed woodworking, playing cards, growing flowers, doing yard work…especially chasing leaves from his yard, and having coffee with friends. Ron truly loved spending time with the grandchildren and great-grandchildren. Ron is survived by his wife Betty Hamborg of Olivia; step-daughters: Deb (and Ken) Person of Olivia and Patti (and Les) Hemingsen of Renville; his brother Orlyn Hamborg of Belgrade; his sister Eunice (and Merv) Kuehn of Richfield; his brother-in-law Richard Revak of Grasston; his five grandchildren; and his seven great-grandchildren. Ron was preceded in death by his parents; his brothers: Casper Hamborg and Marvin Hamborg; his sisters: Ruth Aasen and Stella Revak; and his sisters-in-law: Marian Hamborg, Gladys Hamborg, and Velda Hamborg.